In January 1920, the United Mine Workers of America launched a major campaign to organize the non-union coalfields of southern West Virginia. Along the West Virginia-Kentucky line, some 3,000 miners responded by joining the union and, under coal company policies forbidding employment of union miners, were discharged from their jobs. Hundreds also were forced to vacate their company-owned homes, and many who refused were forcibly evicted by hated Baldwin-Felts detectives. On May 19, 1920, 13 Baldwin-Felts detectives, including Al and Lee Felts, brothers of one of the agency founders, arrived in the Mingo County town of Matewan on the Tug River to evict striking miners and their families from company houses. The detectives, under an intermittent drizzle, forced several families, including women and children, from their homes at gunpoint and dumped their belongings out on the road. Word of the evictions enraged area miners, who began arming themselves. Matewan’s police chief, Sid Hatfield, 27, a strike supporter, tried to stop the evictions as being unauthorized by law. At 4:00 p.m., as the detectives prepared to leave, Hatfield, accompanied by Matewan Mayor Cable C. Testerman and a host of angry miners, confronted Al Felts near the Matewan railroad station and tried to arrest him. Felts, in turn, tried to arrest Hatfield. As the men argued, shooting started. Hatfield admitted he fired but said Al Felts shot first. A number of the miners and several detectives joined in. When it ended a minute or two later, ten people—seven Baldwin-Felts detectives (including both Felts brothers), two miners, and Mayor Testerman—had been fatally shot. Hatfield and 17 strikers were tried for murder in early 1921 and were all acquitted; such was the hatred of the detective agency. The Matewan Massacre is often cited as the opening of the West Virginia Mine War of 1920–21, which escalated into an armed conflict involving thousands after Hatfield’s murder at Welch later in 1921. From: Savage, Lon. Thunder in the Mountains. Pittsburgh: University of Pittsburgh Press, 1990. Warren Gamaliel Harding (November 2, 1865 – August 2, 1923) was the 29th President of the United States (1921–1923). During his presidential campaign, in the aftermath of World War I, he promised a return of the nation to “normalcy”. This “America first” campaign encouraged industrialization and a strong economy independent of foreign influence. On May 12, 1921, just two months into Harding’s presidency, violence was initiated near Matewan. The miners cut down telephone and telegraph lines and trained their guns on the mines, strike breakers and buildings. 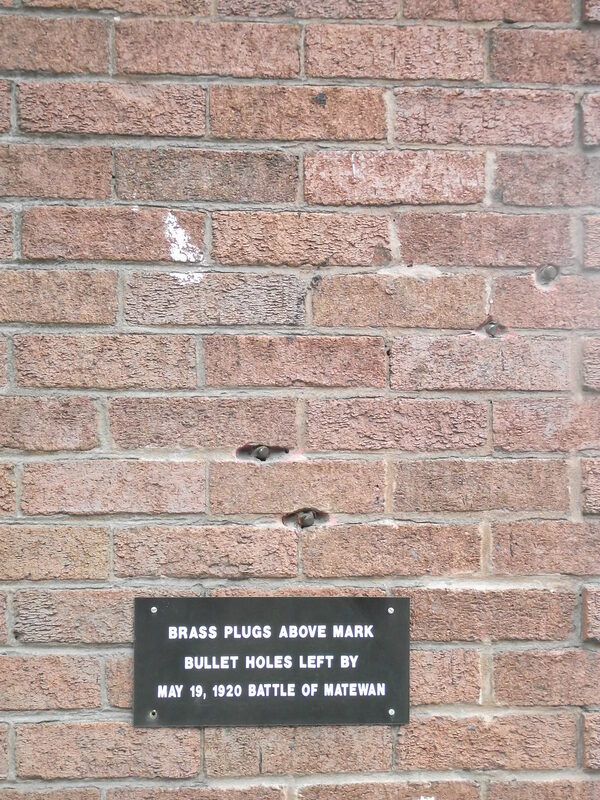 This was know as the Three Day’s Battle; some 10,000 rounds were fired. Ephraim Morgan, Governor of West Virginia, pleaded in person to Harding for federal military support. Harding, who was keeping track of the situation, would only send in troops if state militia could no longer handle the striking miners. On August 1, Sid Hatfield, a prominent Union organizer and Matewan chief of police, was assassinated by mining company agents. On August 28, four days of fighting broke out on a 15 mile front at Blair Mountain. 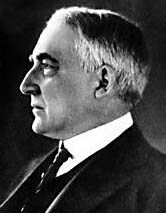 President Harding, having issued two proclamations to keep the peace. Federal troops arrived on September 2, forcing the miners to flee to their homes and hostilities ended on September 4. After the battle, 985 miners were tried and imprisoned for crimes against the State of West Virginia. Many were tried for treason, but most were acquitted. According to Bill Blizzard’s book, When Miners March this Hotchkiss Cannon was owned by the local mining companies (currently owned by the UMWA chapter in Matewan, WV)and was fired in the tent colonies that surrounded the town during the Coal War of 1920-21. If one looks at pictures taken by the US army in the aftermath of Blair Mountain, it is possible that a few of these were used by Don Chafin’s forces during the battle. The term “Hotchkiss gun” refers to the Hotchkiss Revolving Cannon, a revolving barrel machine gun invented in 1872 by Benjamin B. Hotchkiss (1826–1885), founder of Hotchkiss et Cie. It was a built-up, rifled, rapid-fire gun of oil-tempered steel, having a rectangular breechblock which moved in a mortise cut completely through the jacket. It was designed to be light enough to travel with cavalry, and had an effective range beyond that of rifled small-arms. 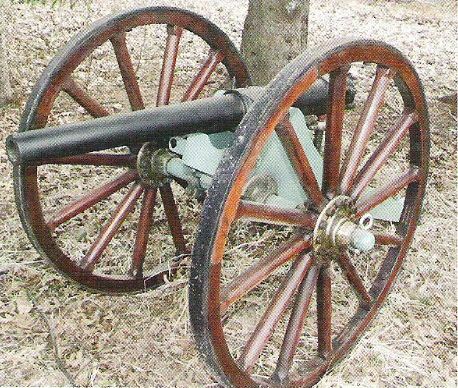 The revolving Hotchkiss cannon had five 37 mm barrels, and was capable of firing 43 rounds per minute with an accuracy range of 2,000 yards (1,800 m). Each feed magazine held 10 rounds and weighed approximately 18 pounds (8 kg). Carbide lamps, properly known as acetylene gas lamps, are simple lamps that produce and burn acetylene (C2H2) which is created by the reaction of calcium carbide (CaC2) with water. Acetylene gas lamps were used to illuminate buildings, as lighthouse beacons, and as headlights on motor-cars and bicycles. 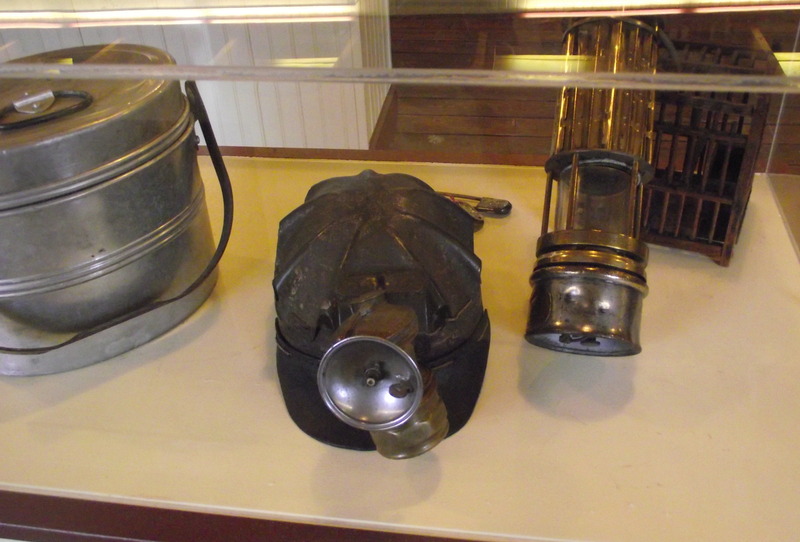 Portable carbide lamps, worn on the hat or carried by hand, were widely used in mining in the early twentieth century. The conventional process of producing acetylene in a lamp involves putting the calcium carbide in the lower chamber (the generator). The upper reservoir is then filled with water. A threaded valve or other mechanism is used to control the rate at which the water is allowed to drip onto the chamber containing the calcium carbide. By controlling the rate of water flow, the production of acetylene gas is controlled. This, in turn, controls the flow rate of the gas and the size of the flame at the burner, and thus the amount of light it produces. This type of lamp generally has a reflector behind the flame to help project the light forward. An acetylene gas powered lamp produces a surprisingly bright, broad light. This unfocused light helps improves peripheral vision in the complete dark. This also causes a small amount of heat to be given off; so it was often used to keep warm during cool nights in the mines. 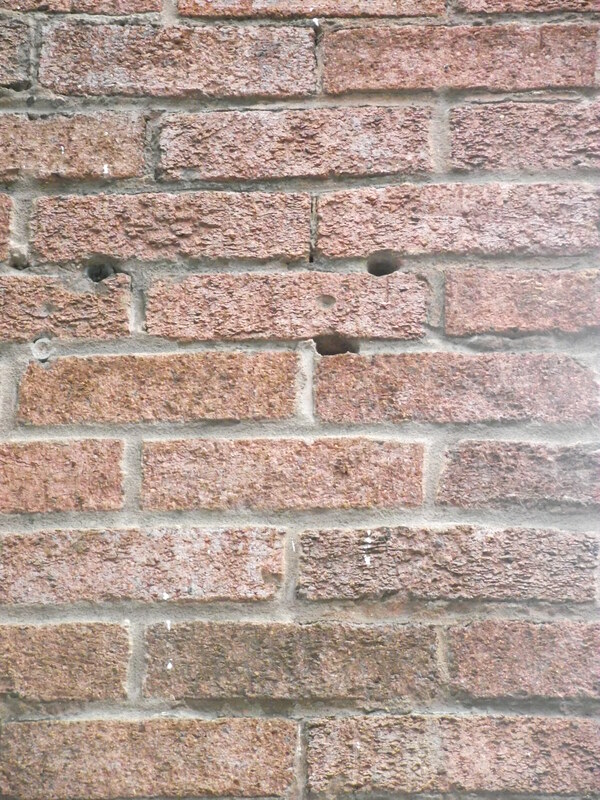 When all of the carbide in a lamp has been reacted, the carbide chamber contains a wet paste of slaked lime (calcium hydroxide). This is emptied into a waste bag and the chamber can be refilled. 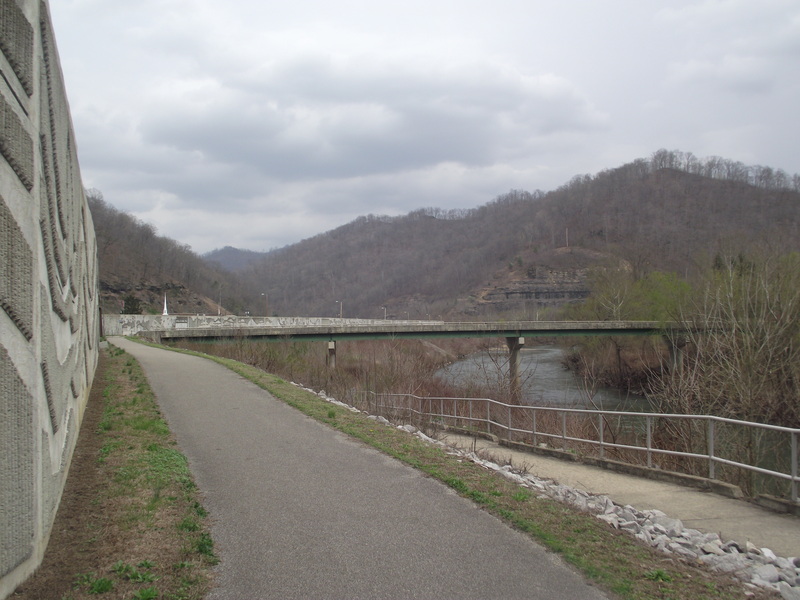 Lots of our visitors who come to Southern West Virginia visit the trails in Mingo County and enjoy the town of Matewan. Ironically, before the trails opened up in our area Matewan had been a town that was hard set and many people felt it’s best days were behind it. Which is sad, considering how world famous Matewan is. Visitors to Matewan often like to watch the movie. The last time I was at Historic Matewan House they were still playing it on a wide screen in that wonderful establishment. 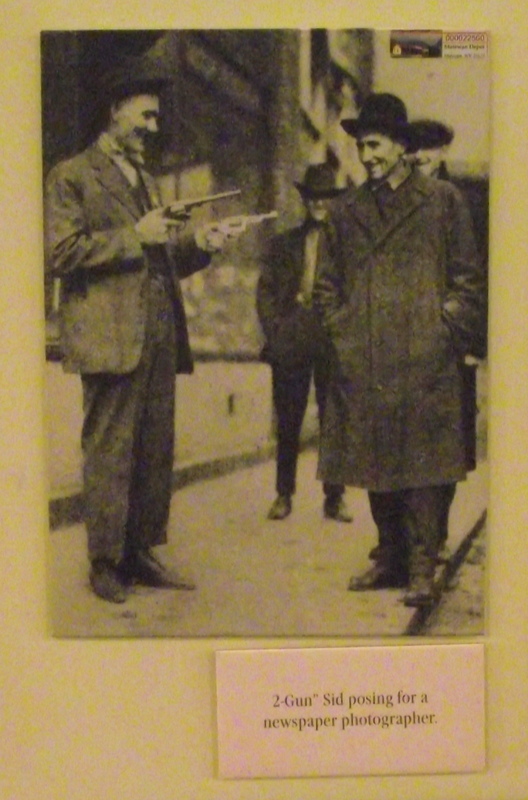 And many of our visitors who come back early in the spring enjoy the reenactment that takes place in Matewan on the very streets where the real shoot out took place, early in the 20th century. Now, I have some big news for our visitors. The reenactment of the legendary Matewan Massacre will be coming to Logan County on St. Patrick’s Day and it is the first time the reenactment has been staged on the stage. The reenactment will be presented indoors at the Savas-Kostas Theater at Southern West Virginia Community Technical College at the Mount Gay campus in Logan. The Matewan Massacre reenactment will be featured twice at SWVCTC on March 17 at 11 a.m. for local gradeschool students and at 6 p.m. for the public. The events will be free of charge. The reenactment will also do two performances in the streets of Matewan in May. This will be the most times that the production has been presented in a year one cast member told me recently. The Matewan Massacre took place in the era of the mine wars when the coal barons who brought in an army of “gun thugs”, private detectives who were in effect a private army working on behalf of the coal barons to keep Union organizers out of the area. In those tough times, when mine operators found out a worker had joined the union they often sent gun thugs (who had been deputized) to evict miners and their families from mine owned housing. The miners were virtually slaves as they lived like indentured servants thanks to the company stores, and traveling from one community to the next could be extremely difficult in those days, making a mine operator that much more powerful. A group of miners had formed a tent city in Lick Creek which lead up to the Matewan Massacre. Baldwin-Felts Detectives were ordered to crack down on striking miners. On May 19, 1920, 11 Baldwin-Felts detectives stepped off the train in Matewan and started evicting miners. They were stopped by Matewan Police Chief Sid Hatfield and several townspeople then went to the sheriff in Williamson and got a warrant to arrest the detectives. The Baldwin-Felts detectives claimed to have a warrant to arrest Sid Hatfield. When the two groups met again sparks erupted and guns were drawn. To this day, nobody knows who fired first, but when when the smoke cleared, three of the miners group, including Mayor Testerman were gunned down in the street. Testerman died later in a hospital in Welch. Court proceedings followed in Mingo County and Hatfield, Chambers and the miners were declared innocent. The detectives then filed charges in McDowell County. Hatfield and Chambers went to Welch to answer the charges. Right before that, Sid Hatfield married Mayor Testerman’s widow and he was unarmed when he went to the courthouse. When the men were on the courthouse steps, C.E. Lively and several other detectives opened fire, gunning them down in cold blood. That was the final straw to a series of events that culminated in the unionization of southern West Virginia and lead to the Battle of Blair Mountain. John Christopher “Chris” Gray portrays Mayor Testerman in the reenactment and Gray has made a study of the life of C.C. Testerman, who came to Matewan, married into a local family and became close friends with Two Gun Sid Hatfield, who actually married Testerman’s widow ten days after the shootout where the mayor was gunned down, supposedly by Baldwin-Felts detectives. But Gray can explain how there is a conspiracy theory behind that one if you stop and talk with him! For many years, cast members have wanted to present the reenactment on stage indoors and to take it on the road. Now they will, and if you are in Logan during that week, you can get the chance, or if you are in Matewan in May, you will have another chance. In addition to the presentation of the Matewan Massacre reenactment at Southern’s Savas Kostas Theater on March 17 at 6 p.m. you can see it in the town itself in Matewan on May 14 at 10 a.m. and 3 p.m.
“People from all over the United States come to Matewan to see the reenactment,” Gray told me, explaining that he first heard of the Matewan Massacre as a kid, in regards to the later gunning down of Sid Hatfield and Ed Chambers on the streets of his hometown in Welch at the courthouse steps.